Do you like historical fiction? Do you like fantasy? If the answer to either or both of these is yes, then you'll love Kat, Incorrigible. Mixing historical fiction and fantasy seems to be a trend as of late. This is the third book I've read in the past few months that features both genres. The book is set in early 19th century England and centers on a family that is just outside the cusp of wealth (actually they're pretty broke) but still mingles in good society. Quite reminiscent of Pride and Prejudice. But the book draws much more from the Gothic tradition of books like Jane Eyre and Wuthering Heights. It's not similar in plot in any way to either of these books, but it hearkens back to the darkness and melodrama of the classic Gothic novels. Kat is the star of this book, both as the book's main character and its strongest selling point. She is a spunky, headstrong, tomboy 12 year old. She's impulsive (she starts out the book by cutting off her hair and trying to run away), stubborn (no one can keep her from getting her hands on her mother's magic books), loyal (she'll do anything to help her sisters), brave (battles head-on with her enemies, perceived or real), and more. She reminds me a bit of Flavia de Luce of Alan Bradley's mystery series. Like Flavia, she is a delight to read about, but I think she might be a tad irritating if I had to deal with her in real life. Since the family is desperate for money (to pay off Kat's brother's gambling arrears), Elissa the oldest sister is going to marry the horrible (but rich) Sir Neville. Kat is bound and determined to stop this. In a parallel plot line, Kat finds her deceased mother's magic book and ends up being thrust into a world of magic that she couldn't have imagined. The two plot arcs intertwine as Kat has to get her sister away from Sir Neville while also juggling magical powers and magical politics. The plot toes the line between melodrama and silliness at times and occasionally crosses that line, but mostly it is great fun. I wouldn't say the book is predictable, because there are many twists and turns, but once you are on a straight path, you can usually see where it's going. Some of the book's immaturity may be due to the fact that it's marketed toward MG rather than YA. Similarly, the early novels of Harry Potter were much more childish than the later books. 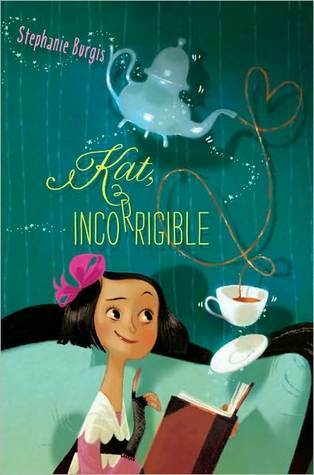 Regardless, I quite enjoyed Kat, Incorrigible. I recommend it for anyone who likes strong, bold characters and history with a touch of magic. I love silliness and whimsy in my MG so this sounds perfect for me. And I know I'm going to love Kat! Your right, historical/paranormal/fantasy seems to we a growing trend. I love it, when it's done well! I've heard good things about this one, and I'm sure the silliness is probably directed toward the younger audience just like you said, so it's easier to overlook as a flaw. I don't read too much MG so I'll probably pass on this one but it would be perfect for my younger cousins who love to read so I'll be sure to add it to their lists:) Lovely review Alison! Sounds like a great book! Loved the review! This looks great. Gonna check it out! Oh too bad, I really liked this one. I pitch it at my library as a "Princess Bride" readalike with magic. I loved the silliness and it didn't deter my enjoyment but I can see how it could. I'm really looking forward to the next book in this series. I've thought and thought about reading this one! Thanks for the review. I might have to get around to it. Aw, I liked this one! I liked the silliness and Kat's quips. You are just giving incredible recommendations with your year-end reviews! My TBR list is growing and it's all your fault!